Pound cakes are one of my favorite desserts to make. They are so easy to make. I can whip up a pound cake in my KitchenAid mixer in the time it takes my oven to preheat. The key is to have all your ingredients at room temperature and measured out before you start. This pound cake is SO good. It has incredible almond flavor. The cake is soaked in an amaretto syrup while it is still warm. The syrup keeps the cake super moist. 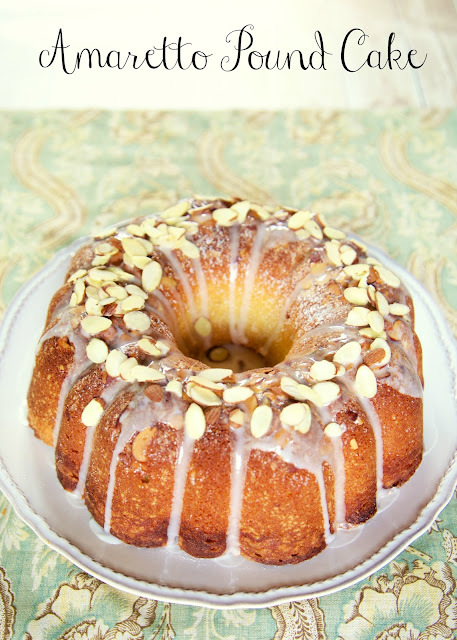 I topped the cake with a quick almond glaze and some sliced almonds. YUM! I love almonds, so I was in heaven eating this cake! Preheat oven to 325ºF. Grease and flour a 12-cup Bundt pan. Set aside. Beat butter and cream cheese at medium speed with a heavy-duty electric stand mixer until creamy. Gradually add sugar, beating at medium speed until light and fluffy. Add amaretto, almond extract and vanilla, beating just until blended. Slowly add flour to butter mixture, beating at low speed just until blended after each addition. Add eggs, 1 at a time, beating just until blended after each addition. Pour batter into pan. Bake 65 - 70 minutes or until a long wooden pick inserted in center comes out clean. During last 10 minutes of baking, prepare Amaretto Syrup. Put ingredients in medium sauce pan and bring to a boil. Boil for 3 minutes, stirring constantly. Use immediately. Remove cake from oven, and gradually spoon hot Amaretto Glaze over cake in pan. (I used a wooden skewer to poke holes in the bottom of the cake for the syrup to seep into. Cool completely in pan on a wire rack. Turn cake onto a cake plate. Whisk together powdered sugar, milk and almond extract. Pour over cooled cake. Sprinkle with sliced almonds. First of all, I love amaretto so thank you for the recipe! Second of all, what an awesome stand mixer - the color is amazing! Would totally match my wine themed kitchen. Thanks for the opportunity to win! I've really been into all things almond-flavored here lately, so as soon as I can get to a liquor store, I am making it FOR SURE! Thanks for hosting! Great Blog! Definitely making this one. Thank you! 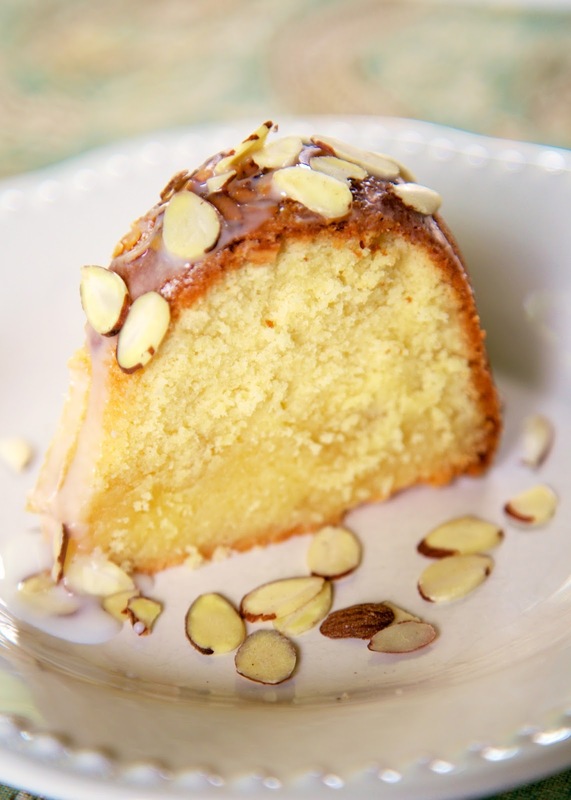 I love pound cakes too and almond is my favorite as well!! Pinning!! I made this cake Wednesday afternoon. I work 11P-7A and a coworker and I are enjoying a piece right now for our midmorning "snack"! I am going to toast a piece when I get home and spread some cream cheese on it for breakfast! This sounds amazing! I love amaretto! Thanks, in the oven as we speak. Can't wait! Super dumb question so don't mind me (We'll call it preggo brain ;)), but do we use amaretto flavoring/syrup o amaretto alcohol. I can't wait to try this recipe! I used amaretto alcohol. Enjoy! Just tried this recipe. All I can say is it is great!!! Would this dough keep in the fridge or freezer for a few days? Absolutely NOT. Bake the cake and freeze it baked. It will be fine. All recipes on the site have a print option. On this recipe, click (Printable Recipe) under the recipe title, before the ingredients.